Poetry, poetry, poetry! Do you recognize yourself in any of the lines above? You just finished a project on “Having Dinner with a Poet”. And even if you didn’t know it, you spun a tale! In this web quest, we will all become Pretenders. We will play the roles of poetry analyst and interpreter. You will create your own poem using a style and rhyme scheme that are similar to ones Shel Silverstein often used. 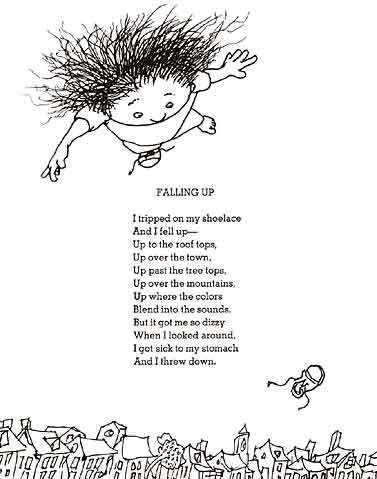 Why Shel Silverstein? Well, he was a writer, an illustrator, a poet, a guitar player;- a songwriter, a performer, heart-warmer. He wrote books and poetry and songs for people of all ages. His poems have messages for young and old,- for big kids, little kids, who don’t like to be told…what to do. Let us begin. Sooooooo… "Come in, come in!" 3. *As you figure out each rhyme scheme, compare your bubble sheet to another group’s sheet. If you have different schemes, brainstorm about how you got your answers and decide who (if anyone) should re-work their patterns. 4. Print out the Analysis/Interpretation Sheet to help guide you through the reading of the following poems. You and your partner can write out the answers on one sheet or you can audio-record your discussion of the poem using the questions to guide your discussion. 5. Click on the following link to learn how to write Clerihews. 6. Choose a specific person or thing and begin brainstorming your rhymes with your partner. Here is an example to get you started. Find his name on a ten-dollar bill! If you need help with rhymes, go to this site. Just type in any word (names included) and it gives you rhymes for your word up to six syllables! Highlight and print out the lines below to create your own Clerihew. Use these lines to create your second Clerihew. Your finished products will be evaluated using the following rubric. It lists in detail what you need to include in your product in order to get the highest possible score. Your poem is missing a line(s). Your poem has four lines. Your first line didn't name a person, you are missing some rhymes. Your Poem has four lines, the first 2 rhyme, the second 2 rhyme. The first line names a person. Your poem is humorous. Your Poem has four lines, the first 2 rhyme, the second 2 rhyme. The first line names a person and the second line ends with something that rhymes with that name. Your poem is humorous. Your presentation is missing a line(s). You didn't name a person in the first line and you are missing some rhymes. Your Presentation has slides that show four lines. The first line didn't name a person and you are missing some rhymes. Your Presentation has slides that show four lines, the first 2 rhyme, the second 2 rhyme. The first line names a person. Your presentation is humorous. Your Presentation has slides that show four lines, the first 2 rhyme, the second 2 rhyme. The first line names a person and the second line ends with something that rhymes with that name. Your presentation is humorous. Your performance/recital is missing a line or lines. You didn't name a person in the first line and you are missing some rhymes. Your performance/recital includes four lines. The first line didn't name a person and you are missing some rhymes. Your performance/recital includes four lines, the first 2 rhyme, the second 2 rhyme. The first line names a person. Your performance is humorous. Your performance/recital includes four lines, the first 2 rhyme, the second 2 rhyme. The first line names a person and the second line ends with something that rhymes with that name. Your performance is humorous. When you have finished this unit, you will have accomplished several things related to poetry. You will have read and learned about Shel Silverstein and his style of poetry. You will have interpreted poems and analyzed rhyme schemes. You will have explored the Clerihew form of poetry and created your own Clerihew poem. If you would like to read some poems written in a similar, humorous, nonsensical form by a poet who lived and wrote 115 years ago, go to this site. His name was Edward Lear. If you can figure out why I included this song, you will get bonus points for your product!!! All poems and illustrations are the original works of Shel Silverstein. The lesson on Clerihews was taken from the PoetryTeachers.Com website and was written by Kenn Nesbitt. Thanks go to RhymeZone for their rhyming dictionary site. 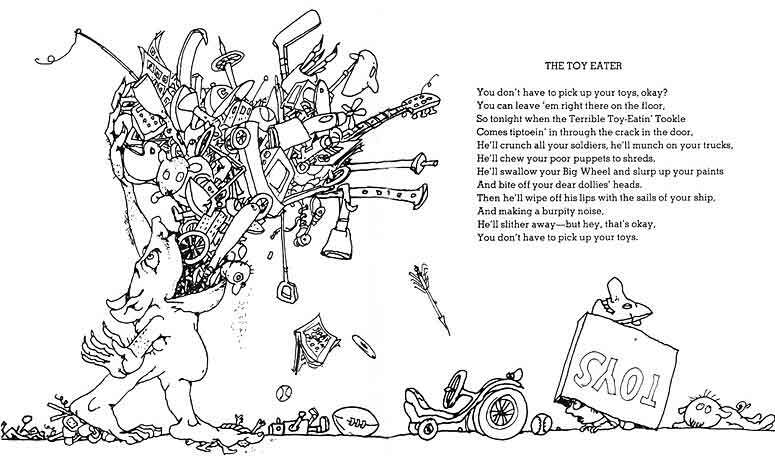 Audio: Shel Silverstein Reads "The Toy Eater" is from the New York Times on the Web, wav belongs to Dr. Hook and Shel. Thanks are also in order for all the other websites that provided a large offering of information about Shel Silverstein and his work. This unit was written for a target audience of 9th grade English students. It can easily be adapted for younger or older students by adding to, or adapting, the guided reading questions. The questions can be re-phrased to be more analytical and interpretive, depending on your audience. Please feel free to work with them in whatever manner best suits your audience. For teachers and others interested in more poetry activities, the Poetry Teachers site has a plethora of activities, contests, and ideas to motivate students to write. This lesson is also a great lead-in to the Limerick style of poetry made famous by Edward Lear.